As the weather cools down and the leaves change color, the pace at which marathons occur (pun intended) pick up. Almost every weekend, in every area of the country, one can find a race. A newcomer to racing? Look for a fun 5k. A veteran? You've probably registered for a few races already. New to running completely? Come with me. 1) Set a goal. The first step in starting your running program is to channel your motivation. Put differently, ask yourself why you're starting it and what you hope to achieve by completing it. Are you interested in trying a new activity? Or are you ready for a new challenge, like completing a race? Either way, figure out why it is YOU want to run. 2) Find a shoe that fits. Whether your just starting out or have been running for years, make sure the shoe you're wearing is right for your foot. Do not pick a shoe because of the color or the cost (I've done both!) They should cost approximately $100 but go for the one that fits your foot the best. Visit a local running specific store and let them know that you would like a shoe fitting. They do these often and will know what you're talking about, I promise! Your feet carry you thorough life... make sure they are properly cared for! 3) Find a program or work with a trainer. There's a method to the madness when training for a race. If you are just starting out with running, plan to walk before you run. Literally. Walking first allows your soft tissue time to get used to the exercise, so give yourself adequate time to work up to running. A foundation must be built before building the house (running) on top. 4) Look the part. While you don't have to buy a whole new wardrobe for running, you should have some options that work well with the external elements (pants, windbreaker, hat). Make sure your clothes and socks are made from a material that pulls moisture away from your skin, no cotton. 5) Care for the clothes. Washing your workout wear daily is a must. And please do not, for any reason, put it in the drier! Athletic wear is not meant to go into the drier or see the likes of fabric softener. It will ruin the fabric and you'll have to replace it far sooner than if you line dry the items. If you are working out every day, you'll need at least two of everything. 6) Fuel properly. Running is not an excuse to include more sweets or french fries into one's diet. I know, because I've tried! Think of this analogy, it's like putting soda pop into a car when the car clearly works better with gasoline. The same practice holds true for your body. It will perform better if you give it high quality, nutritious food and eat everything else in moderation. 7) Remember why you're running. Maybe you're running a race for a charity that is near and dear to your heart, or maybe you're running to improve your emotional and physical well-being, but either way, keep moving. All athletes, even the best in the world, have days when they don't feel like lacing up their kicks, but 100% of people feel better when they're finished. 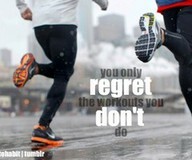 You will regret not working out, but you'll never regret completing the workout.